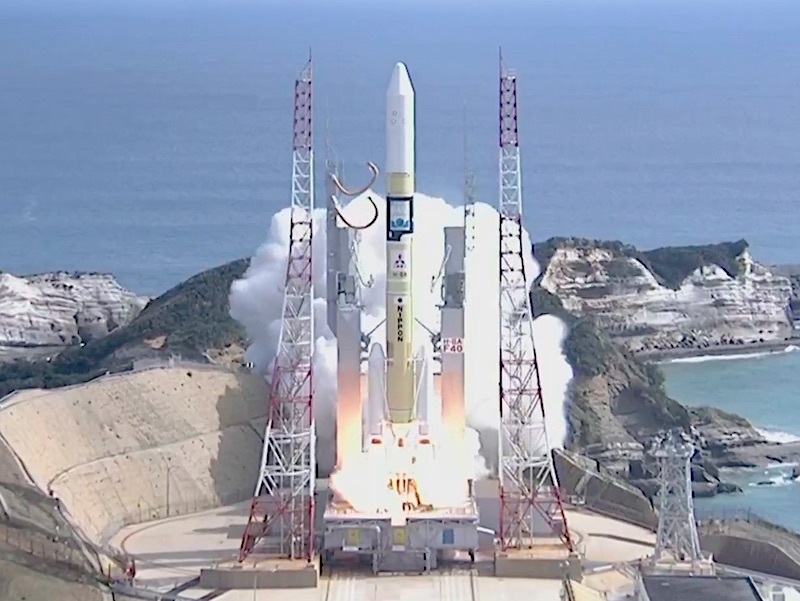 Nicknamed Ibuki 2, Japan’s second Greenhouse Gases Observing Satellite rode a H-2A rocket into orbit from the Tanegashima Space Center in southern Japan. Five other satellites from Japan, the United Arab Emirates and the Philippines accompanied Ibuki 2 on the flight. The 187-foot-tall (57-meter) H-2A rocket fired off its launch pad on Tanegashima Island at 0408 GMT (12:08 a.m. EDT; 1:08 p.m. Japan Standard Time), marking the 40th launch of Japan’s workhorse H-2A booster. Propelled by a hydrogen-fueled LE-7A main engine and two strap-on solid rocket motors, the H-2A raced through a partly cloudy afternoon sky with 1.4 million pounds of thrust. The solid rocket boosters burned out and dropped away from the H-2A rocket around two minutes after liftoff, and the rocket’s guidance computer commanded its engine to swivel, steering the launcher toward the south after an initial trajectory toward the east, a “dogleg” maneuver to ensure parts of the vehicle do not fall on land downrange. The H-2A’s payload fairing jettisoned in the fifth minute of the mission, and the first stage shut down and jettisoned around six-and-a-half minutes after liftoff. An upper stage LE-5B engine, also consuming super-cold liquid hydrogen, ignited for eight-and-a-half minutes to accelerate into a target orbit ranging between 369 miles and 380 miles (595 to 613 kilometers) in altitude. The rocket achieved the correct orbit, with an inclination of 97.8 degrees to the equator, a path that will take Ibuki 2 and its co-passengers over the poles on each lap around the planet. Mitsubishi Heavy Industries, the H-2A rocket’s prime contractor, confirmed the deployment of Ibuki 2 from the launcher around 16 minutes into the flight. 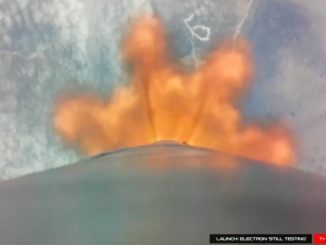 But the rocket passed out of range of a tracking station, as expected, before officials could verify the mission’s other satellites successfully deployed. More than an hour later, the rocket flew back over a ground station, and officials announced the separation of KhalifaSat, the first Earth observation satellite built in the United Arab Emirates. The successful launch extended a streak of successful Japanese H-2A and H-2B rocket launches to 41 missions in a row, a record dating back to 2003. It was also Japan’s sixth orbital launch of 2018, including H-2A, H-2B, Epsilon and SS-520 rocket missions — all successful. 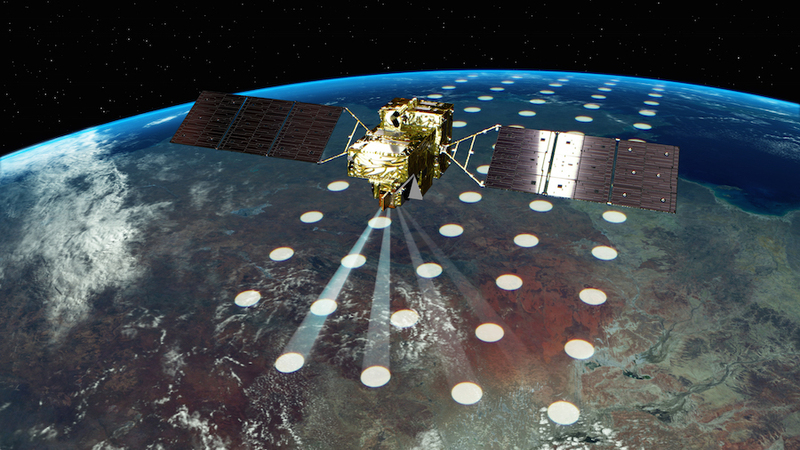 The Ibuki 2 satellite is a joint project between the Japan Aerospace Exploration Agency, the Japanese Ministry of Environment, and the National Institute of Environmental Studies. 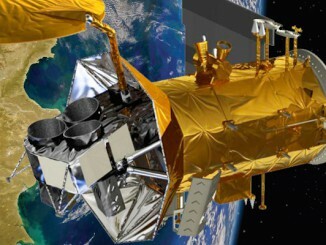 Japanese officials conceived the climate research mission as a replacement for the Ibuki satellite, which launched in January 2009 and became the first satellite dedicated to measuring greenhouse gases from space. Ibuki means “breath” in Japanese. Carbon-based greenhouse gases — which act as an insulating force and can drive up Earth’s temperatures — come from both natural and industrial sources. Ibuki 2 will help scientists sort out which gases come from natural sources, and which can be attributed to human activity. Built by Mitsubishi Electric Corp., the spacecraft weighed nearly 4,000 pounds — about 1,800 kilograms — at launch, and is designed for a five-year mission, with a target for seven years of scientific observations. It hosts a thermal and near-infrared sensor for carbon observation, which includes a spectrometer and a cloud and aerosol imager. Noda said Ibuki 2 will address challenges in separating carbon dioxide gas emitted by natural phenomena, and molecules generated by human activity. “To use CO2 as an example, it doesn’t only come from humans burning fossil fuels like oil and coal,” she said. “It’s also found in animals’ breath and volcanic gases from volcanoes, so it’s a natural molecule that’s not just from human activity. So CO2 comes from many places. Before the launch of Ibuki, and the launch of NASA’s similar Orbiting Carbon Observatory-2 mission in 2014, scientists relied on greenhouse gas data collected by a scattering of ground-based, airborne and ship detectors. JAXA managed development of the Ibuki 2 spacecraft and its launch, overseeing technological improvements designed to make the new satellite better than its predecessor. “Ibuki’s observation is accurate enough to detect CO2 concentrations of 4 ppm, or 4 parts per million. Ibuki 2 is eight times more accurate at 0.5 ppm. This will give us more precise data on greenhouse gas emissions,” said Masashi Abe from JAXA’s space technology directorate. “As of now, total greenhouse gas emissions for all countries have been roughly flat or increasing, because although developed countries are introducing renewable energy and taking other action to cut greenhouse gas emissions, developing countries are using more energy and that’s adding emissions. That’s the current situation,” Setouchi said. 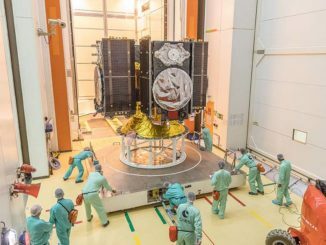 The 727-pound (330-kilogram) KhalifaSat satellite launched Monday in the lower berth of the H-2A rocket’s dual-payload adapter. Manufactured at the Mohammed bin Rashid Space Center in Dubai, KhalifaSat is the first observation satellite built in the United Arab Emirates It’s a follow-up mission to the UAE’s DubaiSat 1 and DubaiSat 2 Earth-imaging satellites, which were largely manufactured in South Korea before their launches in 2009 and 2013 aboard Russian-Ukrainian Dnepr rockets. 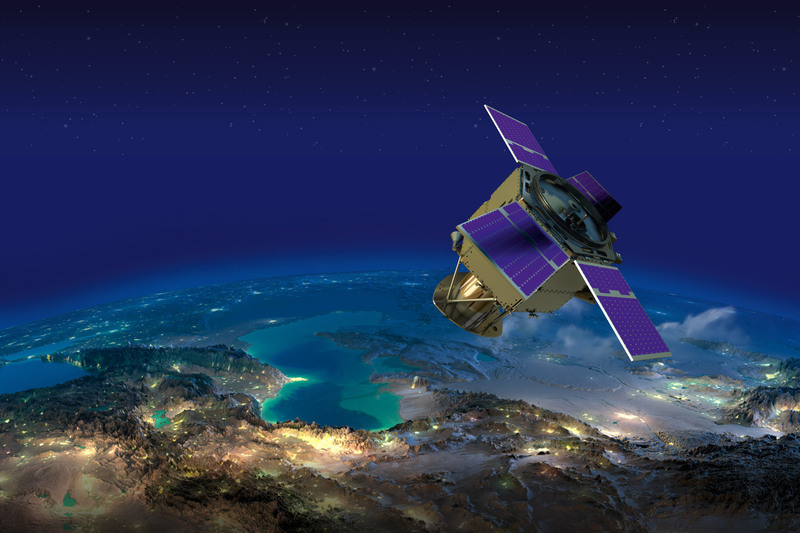 The optical imager on KhalifaSat will be able to resolve features on Earth’s surface as small as 70 centimeters, or about 27 inches, according to the mission’s official website. KhalifaSat is a milestone mission as UAE engineers prepare a Mars orbiter for launch. The Emirates Mars Mission will launch from Tanegashima on a dedicated H-2A rocket in July 2020, further extending UAE’s space cooperation with Japan. Diwata 2B is a 123-pound (56-kilogram) satellite built in the Philippines by PHL Microsat, a consortium of students and engineers founded in a collaboration between the Philippines’ Department of Science and Technology, University of the Philippines Diliman, and Japan’s Hokkaido University and Tohoku University. Diwata 2B carries optical cameras and an Earth-imaging telescope, plus an amateur radio payload. Ten-Koh is a 50-pound (23-kilogram) satellite from the Kyushu Institute of Technology in Japan. Ten-Koh will collect data on the environment of low Earth orbit, and chart the degradation of advanced spacecraft materials during its mission. The satellite will measure radiation, magnetic flux density and electron density for a mission lasting at least six months. AUTcube 2 is a 3.5-pound (1.6-kilogram) 1U CubeSat developed at the Aichi Institute of Technology in Japan. The multipurpose CubeSat will test optical communication technologies, virtual reality imaging cameras, conduct electromagnetic interference experiments, and test techniques for future deep space communications capabilities. STARS-AO, a 3-pound (1.4-kilogram) 1U CubeSat developed at Shizuoka University in Japan, will demonstrate astronomical observations using an ultra-sensitive miniature telescope. 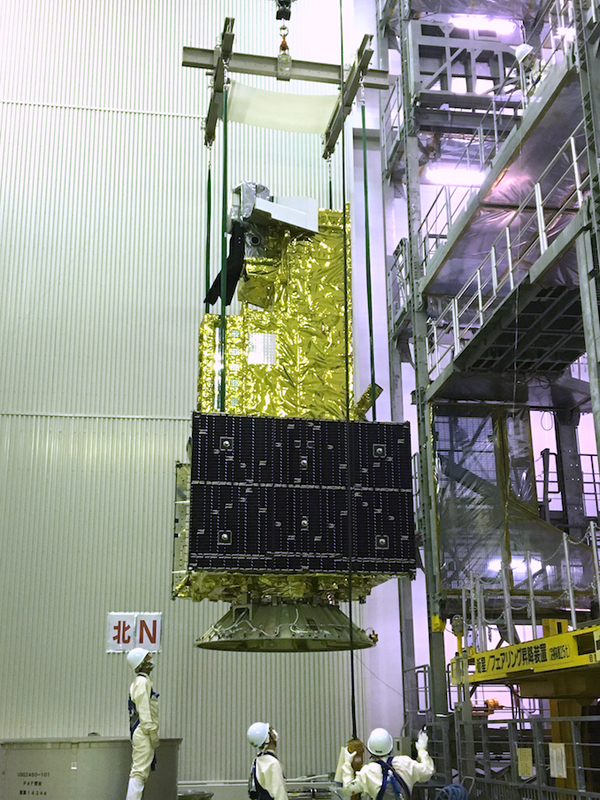 A press kit released by JAXA before Monday’s launch indicated another secondary payload, named PROITERES 2, was also slated to be aboard the H-2A rocket. But the 99-pound (45-kilogram) tech demo satellite, built at the Osaka Institute of Technology, was reportedly removed from the mission. Japanese officials did not discuss the PROITERES 2 satellite during Monday’s launch webcast, and only mentioned the Diwata 2, Ten-Koh, AUTcube 2 and STARS-AO secondary payloads.